Can we be so daring to say that a gentleman isn’t a gentleman until he owns a dinner suit? It’s a rite of passage in a man’s life when he’s fitted for one. It signifies a move into true adulthood, and that he’s distinguished enough to attend events requiring formal dress. But what exactly is a dinner suit, and how does one acquire one? We have all the answers and should inspire you to return to an era of greater elegance. A dinner suit, or a tuxedo if you’re from North America, is simple by definition: Worn for evening affairs of a formal nature, it is comprised of a dinner jacket and trousers, worn with a bow tie. But it’s so much more. A dinner suit signifies prestige and good standing, it denotes good taste, and most important it creates a sense of belonging. In the past, in aristocratic families it was customary to wear a dinner suit to supper each evening—think Evelyn Waugh’s Brideshead Revisited—now we reserve it for the more special occasions. If you’re invited to a black-tie event, then there’s no need to freak out about formal wear. It’s easy to look the part and with the little individuality that comes with conformity, you don’t have to use too much imagination. Firstly, the most favoured dinner jacket style is in simple black wool with matching black satin lapels. It’s a subtle and elegant detail that differentiates it from a business jacket. The collar can vary from a standard notched lapel, though wingtip lapels or a shawl collar are far more dramatic and show your know what you’re doing in terms of evening wear. As for the trousers, keep them simple and let the jacket do the talking: Plain black wool with or without satin stripes along the leg. As for fabric choice for your dinner jacket, you have scope for creatvity. Think about velvet if you’d like a sumptuous and classic look. It’ll give your dinner jacket extra texture and a luxurious feel. Or perhaps if you’re feeling more daring, opt for a blazer in patterned silk. 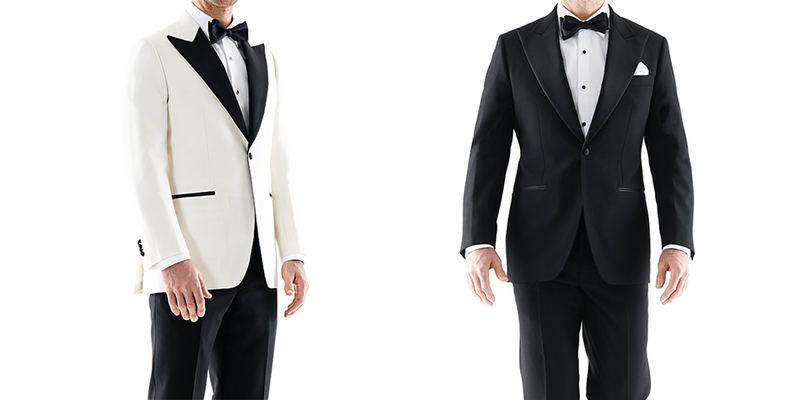 Your tailor can show you a selection of fabrics that will make your dinner jacket pop. By retaining the black satin lapel, it will keep the jacket modest—maybe outlandish, but never garish. Such affairs are about simplicity and good taste, and though you might want to stand out, it must be for the right reasons. When you do meet with your tailor, they will be able to give you the guidance you need. Made-to-measure is the only way to go for a dinner suit. Being tailored, you’ll look and feel great, and the fit will be unparalleled by readymade. You should own at least one dinner suit and you want to make sure that it’s right. It’s a timeless piece that you will wear time and again, so make sure you have the best when you must look your best. Book an appointment with an Oscar Hunt tailor to get dressed to the nines, sixes and sevens.